Every year, my industry holds an enormous trade show we call KBIS. KBIS stands for the Kitchen and Bath Industry Show. Every year, KBIS takes place in a different city. Though due to it million-ish square feet of floor space requirements, those cities are pretty much restricted to Orlando, Chicago, Las Vegas and Atlanta. KBIS isn't just a trade show, it's also an opportunity to attend seminars and network with fellow travellers. HGTV broadcasts from the show floor and the rest of the regular press is in attendance too. The new products that debut at KBIS end up on sales floors within weeks, and that show is often the only opportunity design pros have to kick the tires on stuff they'll be specifying in the year ahead. KBIS starts with a keynote address given by someone everyone admires and whose opinion counts for something. This year, with the industry on its knees and designer-types looking for something, anything to tell them that things will get better; the need for a rallying speaker couldn't be more pronounced. Instead, the committee picked Mike Huckabee. 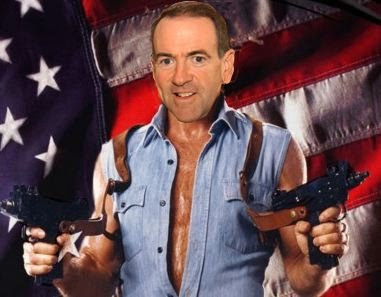 Yes, THAT Mike Huckabee. The failed presidential candidate and creationist extraordinaire. Now Mike Huckabee has what to do with the Kitchen and Bath Biz exactly? I won't wait for an answer. But geez, can we please get someone with an understanding of the industry next time? Hah hah! Perfect! I think your chandelier story would make a good post. It's very now by the way, it reminds me of the Vaughan stuff Christopher Peacock uses.